Whether it's one sign or hundreds of signs, put your name in front of prospective customers with eye-catching and attractive real estate, yard, or site signs. Perhaps one of the most widely used, visible, and effective promotional type of signs around, these types of signs can advertise your business, sell your home, or, for campaign purposes, elect your local, state or federal politician! 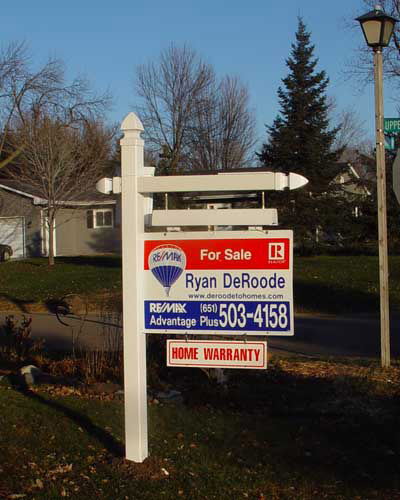 Depending on their intended use, real estate, yard, or site signs come in various shapes and sizes, material options, decoration methods and more. Installation methods are just as varied. By utilizing simple sign stakes or frames you can quickly install and remove some of these signs around your local community (keeping local ordinances in mind, of course!). To draw the attention of a passerby, lawn signs can feature bold, high contrast colors and large fonts. If you're looking for something more durable and semi-permanent, choose a site sign that can be installed on posts set in the ground. Please contact us today and let us answer questions you may have about real estate, yard, site, or campaign signs.